Aloha! 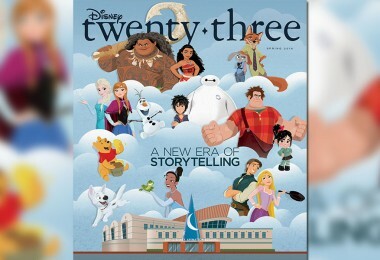 Guests were welcomed to the resort with a bag chock-full of goodies from D23. Following check-in, D23 Members gathered for a VIP Welcome Cocktail Party where they were able to mingle with new friends, sample delicious drinks (including the exclusive “I Lava D23” signature cocktail), and enjoy a barbecue buffet! 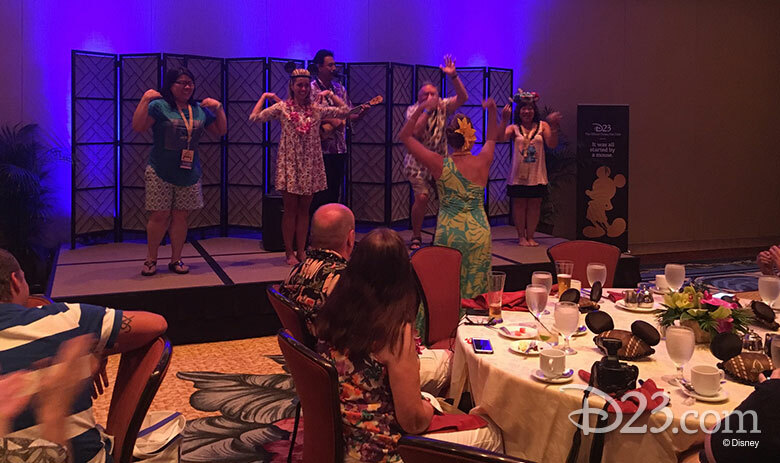 During the meal, guests were entertained with live Hawaiian music and hula dancing. 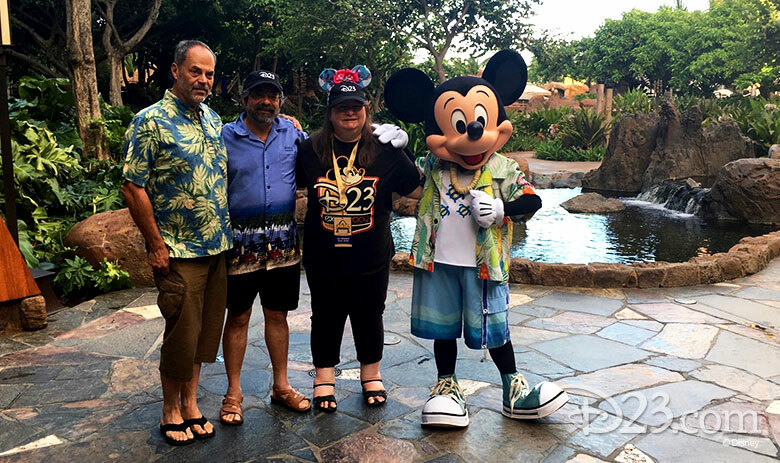 When guests returned to their rooms, they were delighted to see the Menehune had dropped off a very special keepsake—their very own Aulani bathrobe. 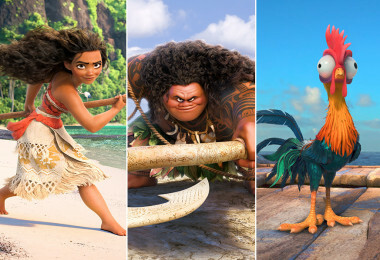 As Walt Disney once said, “we’re just getting started!” Be sure to stay tuned tomorrow for updates from the event—including an insider’s look at the latest film from Walt Disney Animation Studios, Moana. 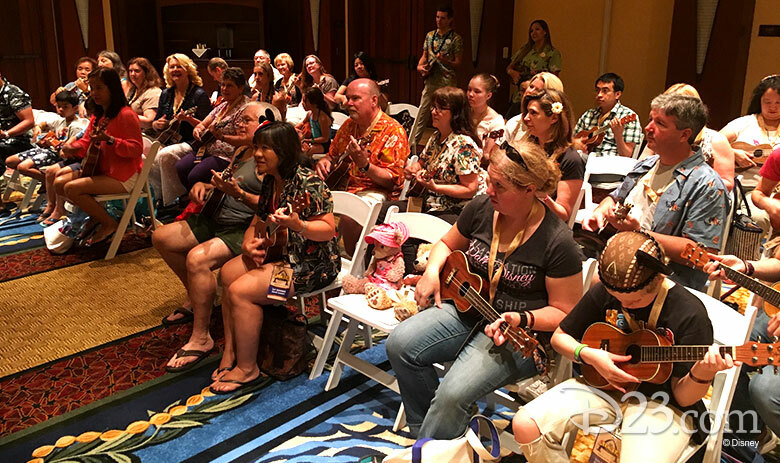 The vacation of a lifetime continues at Aulani, A Disney Resort & Spa, as D23 Members gathered for a second day and enjoyed an exclusive presentation of Walt Disney Animation Studios’ latest film, Moana! 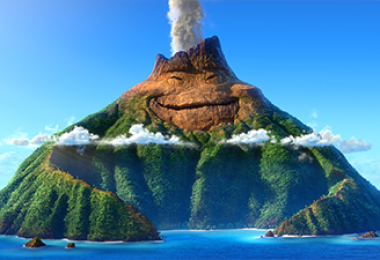 Hyrum Osmond, head of animation for Moana, led this insider’s glimpse at the film. Hyrum shared that he has been a Disney fan ever since The Little Mermaid and Aladdin captured his heart, so working with Ron Clements and John Musker has truly been a dream come true for him. 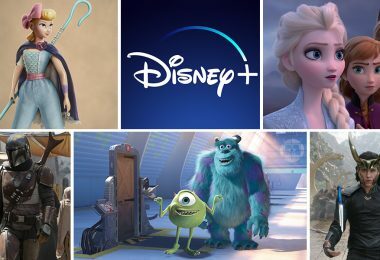 As a Disney animator, Hyrum has worked on a number of films, including Tangled and Frozen—he was the supervising animator of fan-favorite Olaf—and he’s now head of animation for Moana. 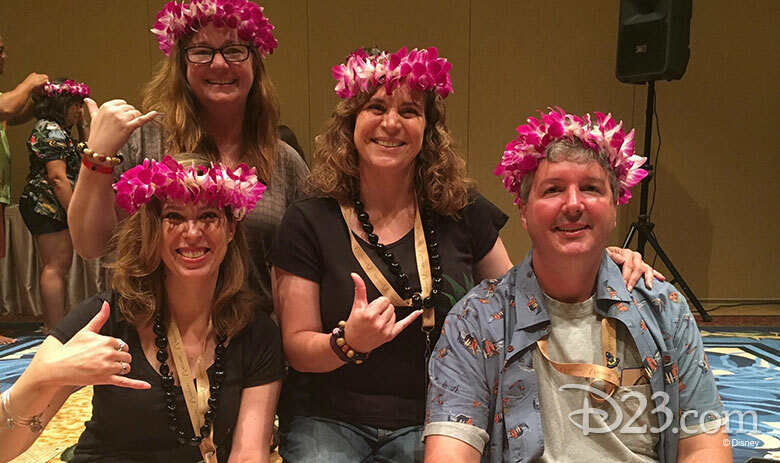 During the presentation, D23 Members had the chance to fall in love with Moana’s story and take a behind-the-scenes look at the development of this beautiful film. 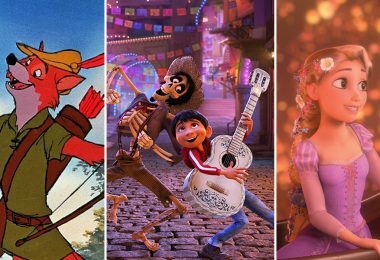 There were misty eyes, hearty laughs, and loud applause after Hyrum shared scenes, early animation, and character development of Disney’s newest animated film. 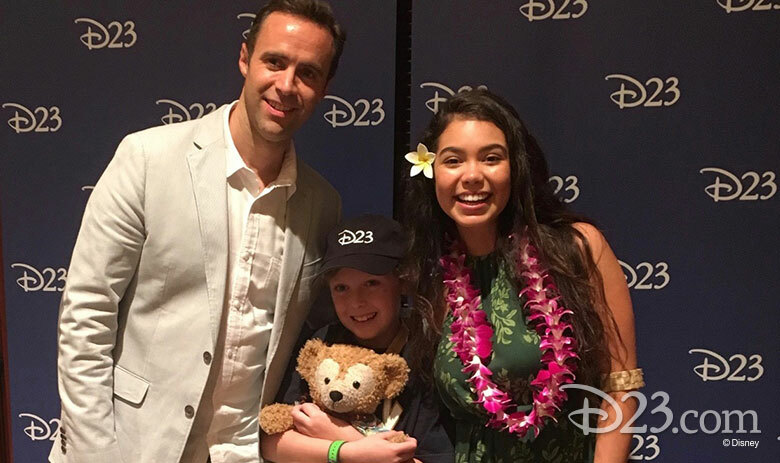 Afterwards, our Aulani ‘ohana was surprised with a very special appearance by Auli’i Cravalho, the voice of Moana! 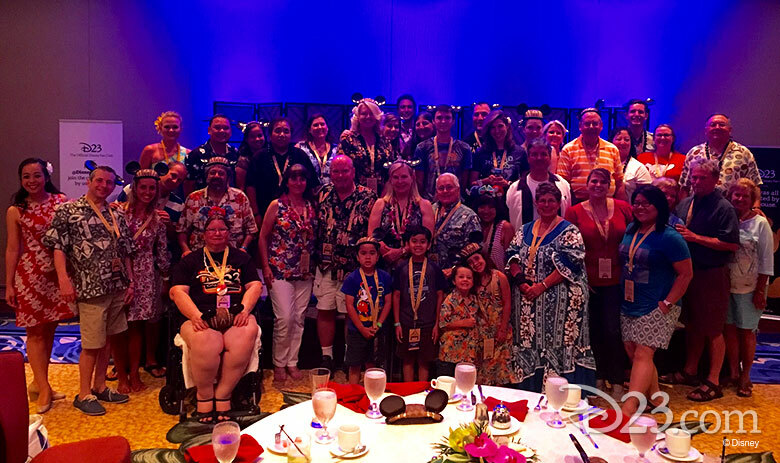 As a native Hawaiian, Auli’i was thrilled to meet with D23 Members. 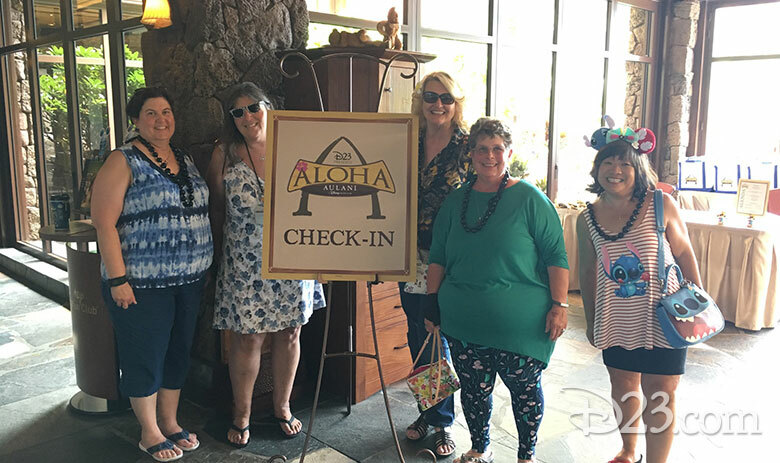 After spending time meeting and greeting Hyrum and Auli’i, the Aloha Aulani guests spent the rest of the day exploring the many amenities this beautiful resort has to offer. 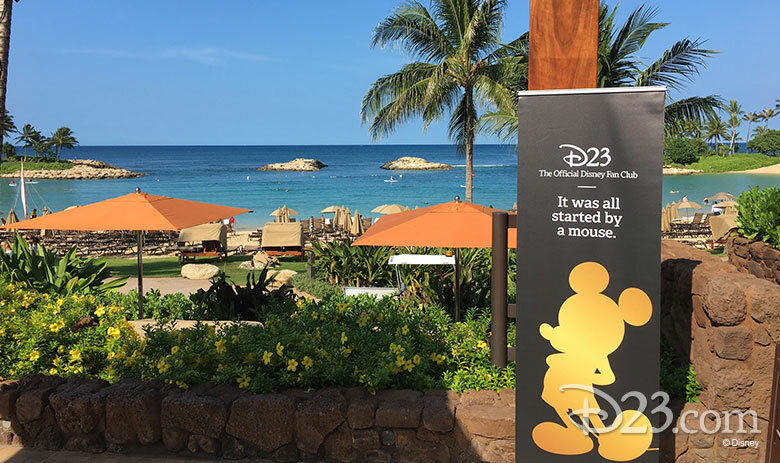 It’s hard for us to believe that D23’s wonderful week at Aulani, A Disney Resort & Spa is already halfway over! We also assembled beautiful kukui nut bracelets and Hawaiian lei crowns, made from fresh flowers grown here in Hawaii. After lunch, the group reconvened to learn the art of hula dancing. 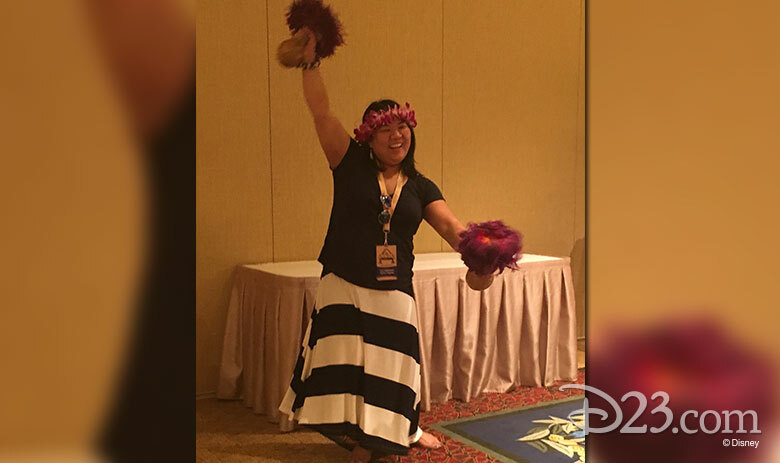 We discovered that hula is not only a form of communication on the islands—it’s also a great workout! 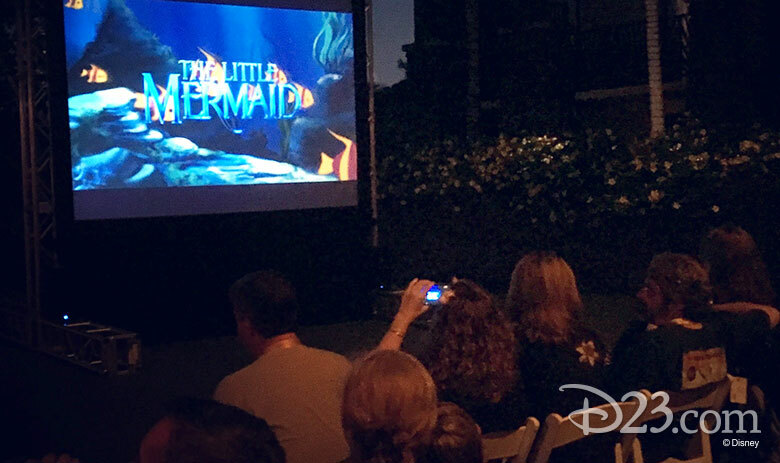 Later in the evening, we all gathered under the stars for a private viewing of The Little Mermaid, complete with a popcorn bar and a variety of scrumptious snacks! It was wonderful to watch the beloved Disney classic again, especially after Hyrum’s presentation about Moana and working with Ron Clements and John Musker. Tomorrow will be a delightfully busy day on our very own patio, filled with visits from very special guests, including Imagineer Joe Rohde. 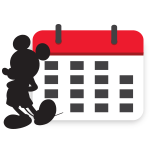 Be sure to stay tuned for tomorrow’s updates. 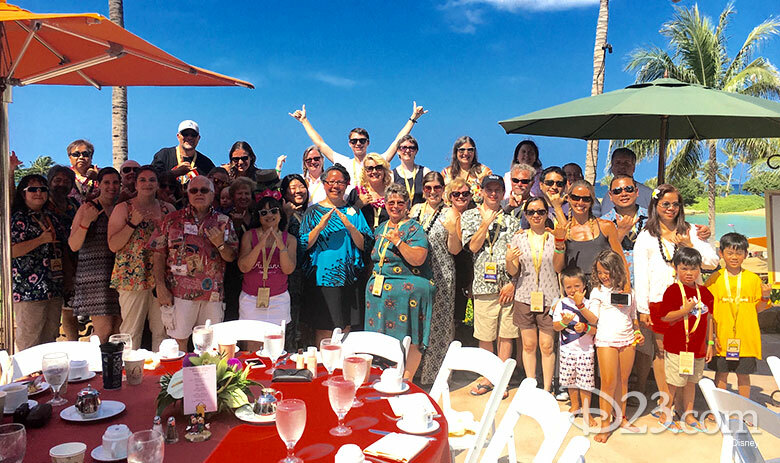 Today the sun was shining bright and it was time for the D23 ‘ohana to head to the beach and a VIP private patio. Throughout the day, guests enjoyed live entertainment, delicious food (including a Mickey-shaped burger bar), and some very special guests. 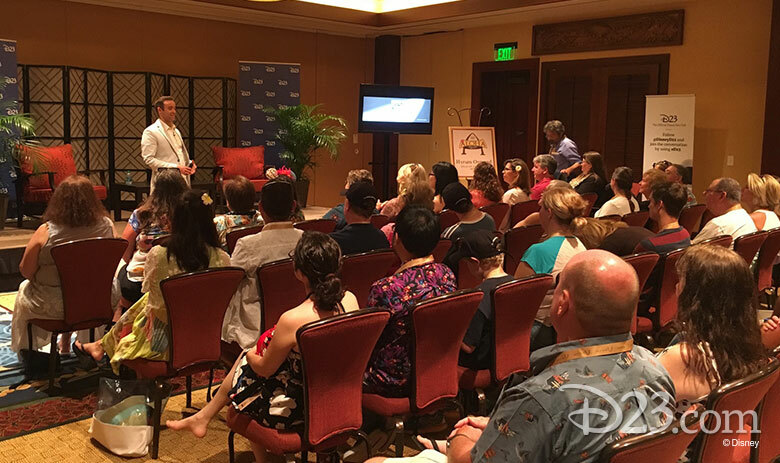 The morning began with a special presentation by Kahulu De Santos, Aulani’s Cultural Advisor. Kahulu shared wonderful details about the beautiful resort, explaining that each guest is on a journey throughout their vacation. Speaking of journeys, Kahulu shared the story behind the limited-edition pin series—only 75 were made—that each Aloha Aulani attendee has been receiving each day and she presented today’s pin, inspired by Menehune. 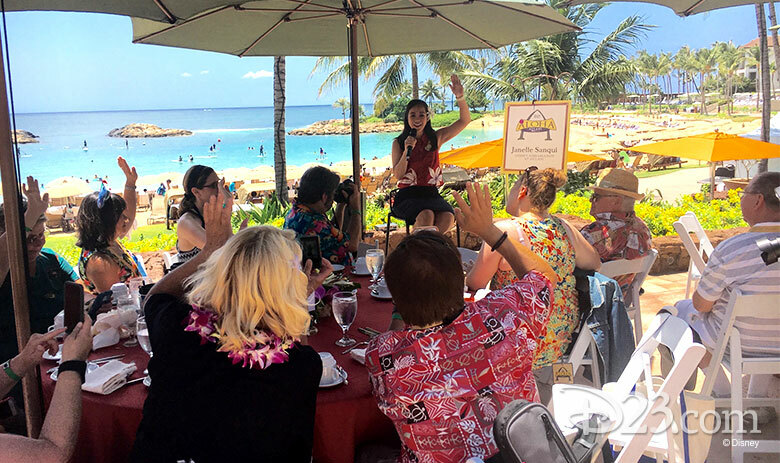 Following some time for playing in the ocean or building sandcastles on the Ko Olina beach, guests had lunch and spent time with Janelle Sanqui, the Disney Ambassador at Aulani. Janelle discussed the role of this historic Disney program here in Hawai’i, as well as her journey with The Walt Disney Company. Her shining personality was contagious and we all were delighted to be in the company of this amazing cast member. The day culminated in an intimate chat with Portfolio Creative Executive for Walt Disney Imagineering Joe Rohde! 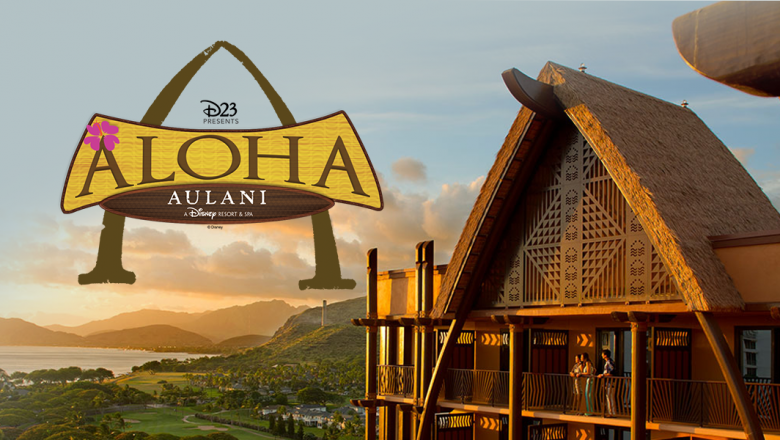 Joe shared the important role that the Hawaiian culture played in the creation of Aulani, as well as some of his favorite stories from the resort’s first five years. After the chat, Joe signed oversized postcards of Aulani concept art for D23 Members, who also had the opportunity to pose for a photo with this iconic Imagineer. 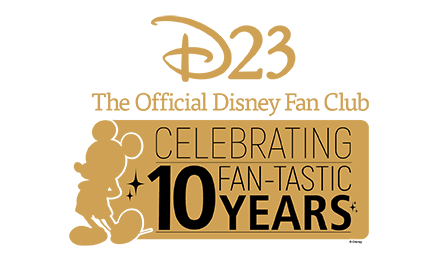 Before it’s time to say goodbye, our group will be raising a glass this fantastic event and five years of this Hawaiian paradise. 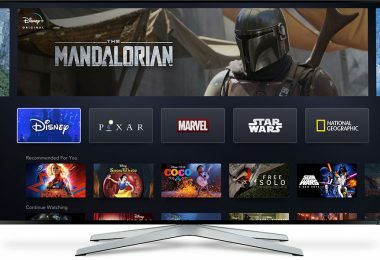 Stay tuned for the last update! 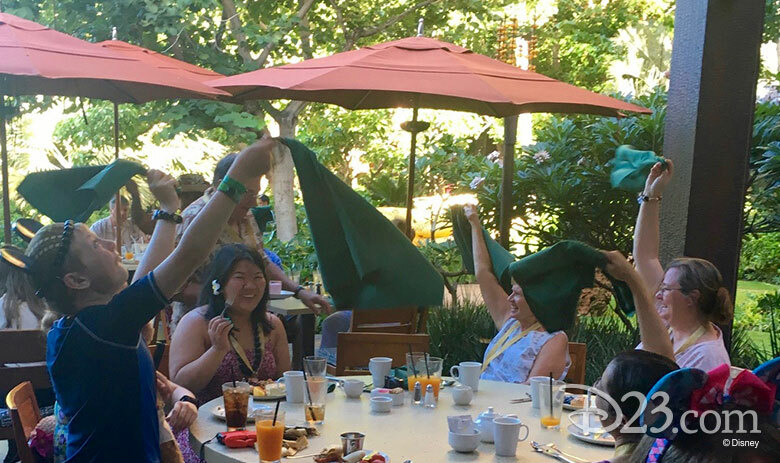 The sun rose on the last day of D23’s Aloha Aulani event and our ‘ohana gathered at Makahiki for a bountiful Disney Character Breakfast. 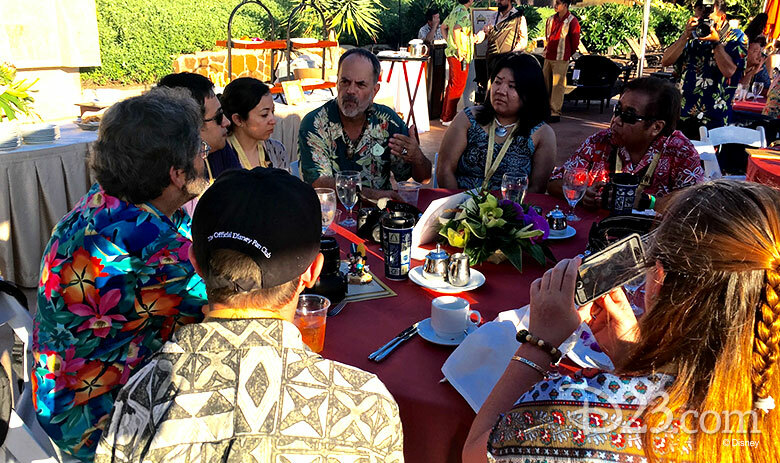 To commemorate the fifth anniversary of Aulani, we were joined by special guest of honor Joe Rohde. Guests had the opportunity to grab a photo with Joe and also with the leader of the club himself, Mickey Mouse! 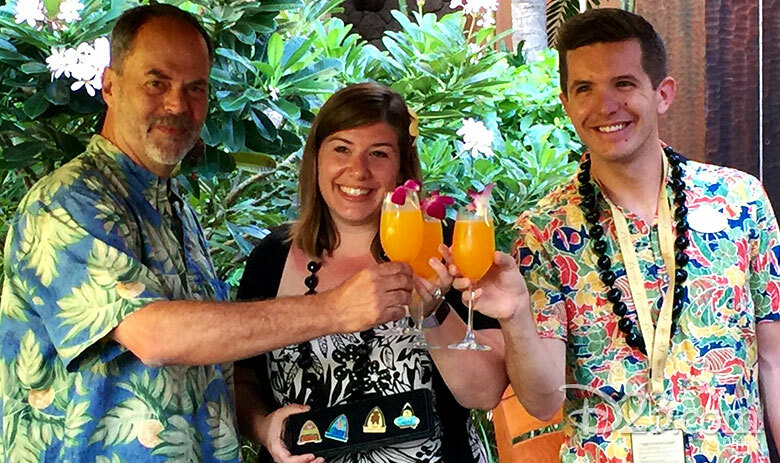 After a delicious meal and special visits with Minnie, Chip, Dale, and Aunty, we raised a farewell toast of POG (passion-orange-guava juice) to our wonderful week together and five years of this Hawaiian paradise. From our ‘ohana to yours, we hope you have enjoyed coming along with us on this journey.